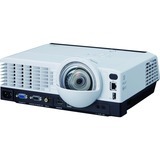 Rev up the interactivity in your classroom with RICOH PJ X4241N short throw projector. It gives you the flexibility to turn your ordinary whiteboard into a digital whiteboard, to play MPEG4s and DVDs, and to have fun with 360-degree projection. All in superb high-definition.